Brief history of my working life. - CORTADOR DE JAMON MALAGA, MARBELLA, SEVILLA, CADIZ, CORDOBA, ESPAÑA, ITALIA. Brief history of my working life. My name as you can imagine is Pedro M. Polvillo, I am from village of Seville. 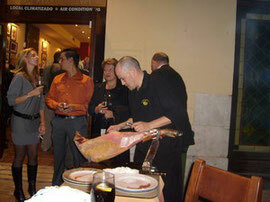 I started to work in the Restaurant "Venta El Aljarafe" which was owned by my parents during more than 30 years. There, with 16 years old I began my working life, first as a waiter (both bar and the chamber), and then at the end of a few months begin to get in the world of Cutting Iberian Hams. Working with my parents continued for 9 years, in which I was refined in the court of the raw material. After this job I have been in several sites, both of waiter of bar, of the chamber as cutter hams, sausages and cheese. As well as responsible in several places. My passion for the cut of ham, has led me to offer my services for weddings, communions, baptisms and other events, both in Sevilla, Malaga and the rest of Andalusia. I also move to the rest of the national territory. Any person who is interested in hiring my services, you can contact me through the link of page.